The American toad is a common species of toad found across the eastern United States and Canada. It is divided into three subspecies the eastern American toad, the dwarf American toad, and the rare Hudson Bay toad. The eggs of the American toad are laid in two strings and can hatch in 3–13 days. The tadpoles have distinctive skinny tails which make them easy to identify. They can reach their adult form in 30–40 days. The eastern American toad is a medium sized toad from 5–9 cm. The colour and pattern is somewhat variable from yellow to brown to black. 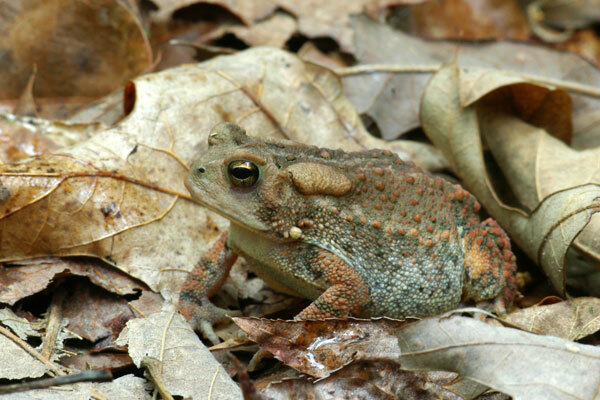 This subspecies of the American toad has no or very little distinctive markings. The dwarf American toad is a smaller version of the American toad which reaches lengths of 6 cm and has generally a dark-reddish color ranging to light red color skin. The Hudson Bay toad is a rare subspecies from Canada.